Science Source/Photo Researchers. Reproduced by permission. using an electrically conductive, washable paste. The electrodes are placed on the head in a standard pattern based on head circumference measurements. Depending on the purpose for the EEG, implantable, or invasive, electrodes are occasionally used. Implantable electrodes include sphenoidal electrodes, which are fine wires inserted under the zygomatic arch, or cheekbone. Depth electrodes, or subdural strip electrodes, are surgically implanted into the brain and are used to localize a seizure focus in preparation for epilepsy surgery. Once in place, even implantable electrodes do not cause pain. The electrodes are used to measure the electrical activity in various regions of the brain over the course of the test period. American Association of Electrodiagnostic Medicine. 421 First Avenue SW, Suite 300 East, Rochester, MN 55902. (507) 288–0100, Fax: (507) 288–1225. aaem@aaem.net. http://www.aaem.net/ . American Board of Registration of EEG and EP Technologists. PO Box 891663, Longwood, FL 32791. (407) 788–6308. http://www.abret.org/index.htm . American Society of Electroneurodiagnostic Technologists Inc. 204 W. 7th Carroll, IA 51401. (712) 792–2978. http://www.aset.org/ . Epilepsy Foundation. 4351 Garden City Drive, Landover, MD 20785-7223. (800) 332–1000 or (301) 459–3700. http://www.efa.org . Joint Review Committee on Electroneurodiagnostic Technology. 3350 South 198th Rd., Goodson, MO 65659-9110. (417) 253–5810. http://www.caahep.org/about/coas.htm . Hofstra University. "Electroencephalography." [cited April 27, 2003]. http://people.hofstra.edu/faculty/sina_y_rabbany/engg181/EEG.html . Bergey, Gregory K., and Piotr J. Franaszczuk. "Epileptic Seizures are Characterized by Changing Signal Complexity." [cited April 17, 2003]. http://erl.neuro.jhmi.edu/pfranasz/CN00/cn00.pdf . Rutherford, Kim, M.D. "EEG (Electroencephalography)." Kid's Health For Parents. June 2001 [cited April 27, 2003]. 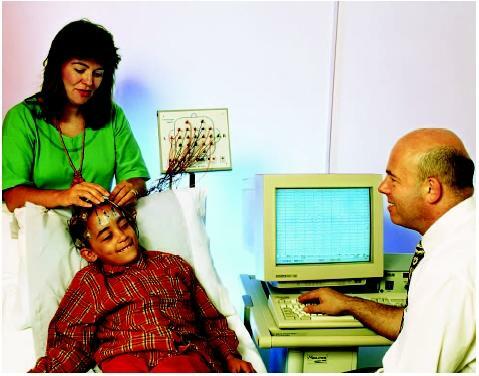 http://kidshealth.org/parent/system/medical/eeg.html . National Society for Epilepsy. "Epilepsy Information: Electroencephalography." September 2002 [cited April 27, 2003]. http://www.epilepsynse.org.uk/pages/info/leaflets/eeg.cfm . My seven yr old had shuddering episode after an esp exciting week and lack of sleep. An EEG was suggested - 1 hr sleep deprived. A slight abnormality was noted in the left frontal lobe - 5 spikes during EEG. He was not very cooperative toward the end of the procedure and the technician needed to re align the wires... Neurologist recommended either to do nothing and watch or do more testing; MRI or 24 hr video EEG. He is bright, normal, healthy boy with no other issues. Unsure as to how to proceed. Any advice would be appreciated. Thank you. A FAMILY MEMBER A WEEK AGO HAD A SEIZURE, WAS RUSHED TO THE HOSPITAL. BLOOD TESTS INDICATED A BACTERIAL INFECTION. A LUMBER PUNCTURE WAS PERFORMED. MENINGITIS AND TB WERE ELIMINATED BUT THE SEIZURES CONTINUED. AN EEG IS GOING TO BE INFORMED WHAT ARE THE IMPLICATIONS? COULD IT BE EPILEPSY? CAN IT BE CURED? PLEASE HELP. Actually I fell down by two weaker with my husband on 22.11.2012. Some small wounds there for right hand and head fell on road directly. I am a diabetic patient but it is very much under control I.e. after meals also only 120. Then I have taken CT scan in one lab as I am a diabetic patient. Suddenly, I got a report that there was an old insult of 2x1.6 cm hypo density os gloisis. After that I took MRI and EEG as per doctor's advice. Surprisingly, I heard that I am getting fits and they gave medicines for minimum five years. After using the medicines one day I went to another Neuro hospital for second medical opinion. They did again MRI with optic, VEP, EEG. They also told that to use medicines compulsory and asked to come after one month. In EEG they mentioned that reported to epilepsy. From 22.11.2012 actually I am suffering. From headache, giddiness, womting sensation and drouziness. After using the medicines also the same problem is facing by me. Is it possible that an old insult will come and give problems . Actually I fell down on 23rd December 1983 while going to office with my husband including my second son 4 months old. Then I got unconscious nearly from 10 am to night 7.30 pm. After that some times only I got headache. In 2010 also I fell down in the office premises while walking suddenly with giddiness. But conscious only. After that I took CT scan. In that no findings of any old insult in that scan. Now why it came now. Please any doctor or known person can explain me because I am very much feeling as I am a working woman. I am writing this from hyderabad, India. Please give me reply as early as possible.